Much of the standard story on print culture and the press in China needs to be reconsidered. This is obvious from reading the three studies (Xiaoqing Ye 2002; Andrea Janku 2003; Natascha Vittinghoff 2002b) discussed here, as well as a handful of others that have appeared recently, including those by Kai-Wing Chow (2004) and Christopher Reed (2004; [read Rudolf Wagner’s MCLC review here]), all dealing with the rise of modern printing methods in China. What happened, then, when the printing presses began to produce news media in the mid-nineteenth century? We thought we knew. There are a great many thick and informative histories published in Chinese and in English, beginning with Ge Gongzhen’s seminal study Zhongguo baoxue shi (History of Chinese journalism) first published in the late 1920s and Roswell Britton’s rereading thereof. These histories are in the format of tongshi, linear histories telling the story of free newspaper-making from its Malacca beginnings in the early nineteenth century to its end in 1949, and creating nice and predictable categories of conceptualization. This account foregrounds the missionary press, the commercial press, and the reformist press. The latter superceded all its predecessors, to a great part thanks to Liang Qichao, China’s first modern journalist. This standard narrative derives from a wealth of institutional and biographical details available in Chinese sources, as well as from sporadic readings of the press. The judgments based on these materials have entered a now almost century-long historiography of writing about the early Chinese press that has, as it turns out, not opened but actually closed many vistas, because it was written from a teleological point of view. The three books under discussion here do something very different. All three begin their search for an alternative narrative of newspaper history from the newspaper text itself, and search out into hitherto neglected archival and textual material, both Chinese and foreign. Each of them comes up with radically new findings about the position, the self-perception, the function, and the importance of the early Chinese news media. Having leafed through thousands of pages of difficult newspaper Chinese, their authors have uncovered a completely new history of the press, a history of continuities and fissures, of infighting and external pressures, of self-confidence and humilities. Theirs is a story equally striking and important as the narratives on which they draw but which they must contradict in many instances. With the appearance of Xiaoqing Ye’s book one is inclined to sigh with relief: Finally we have a scholarly study of the Shanghai illustrated magazine Dianshizhai huabao, arguably one of the most significant pictorials in late Qing China, founded in the 1880s by Ernest Major, a British tea merchant who had successfully launched the Shanghai daily Shenbao a dozen years earlier. A handful of more or less sophisticated coffee table books have featured and explained some of the handsome, amusing, and intriguing illustrations from this pictorial, but there existed no systematic monographic study of the publication’s background and contents. Ye’s book is no such study either, but it presents a valuable mine of material. 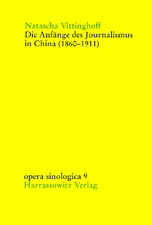 With its aim of reading the Dianshizhai huabao as a “source of Shanghai social history” (p. 2), it not only covers a wide range of material from the pictorial itself (including 137 illustrations, albeit very small ones), but also makes extensive use of the Shenbao as well as contemporary memoirs and literary works. The book, a graciously and delightfully slim volume (especially if compared with the two hefty studies also under discussion here), includes four loosely related parts and a very short introduction and afterword. Part One gives a brief history of the Dianshizhai as the product of Major’s publishing universe. Parts Two and Three deal with stories from the Dianshizhai that depict Shanghai as a city between old and new and as the source of a new urban culture, respectively. Part Four turns to religious practices as depicted in theDianshizhai. In the 1991 dissertation on which this book is based, an intricate argument about urban popular culture had served to connect these parts, which have been rearranged in the monograph. The original argument helped to sustain a distinct sense of coherence that has sadly been eschewed here. One of the focal points in Ye’s monograph is the question of how and whether the Dianshizhai huabao can be used as a source for Shanghai social history. The pictorial shows Shanghai as a locus of change. Yet it remains crucial to question, as Ye herself does, the pictorial’s “reliability as a source for understanding the culture of the time. How typical are its stories of everyday life in Shanghai in the late nineteenth century? To what extent do its commentaries reflect the prejudices of its authors?” (p. 1). Indeed, newspaper science has long since abandoned the thought that the news media are even remotely close to being accurate mirrors of social realities. And theDianshizhai, as many other pictorials worldwide, thrived–as pointed out by Ye–in presenting qi, the extraordinary and the strange. Thus, what was seen on its pages was hardly a reflection of everyday life and everyone’s lives in Shanghai, but rather of peak periods, peak figures, and peak events. This is obvious in the numerous depictions of festivals, and of particular human types, from criminals to dandies and prostitutes, many of which contained elements of caricature and exaggeration (e.g., p. 130). With such material at hand, it is hard to reconstruct the life of ordinary, rather than extraordinary, people. There is naturally a great deal of over- and underreporting to be observed on the pages of the Dianshizhai, and Ye hints at this. Yet apart from her question on the significance of such discrepancies, she could have reflected more on how relevant, significant, and sometimes even dangerous the connections she draws between the depicted realities in the journal and the lived realities in the city are. To give just one example: Ye rightly finds that people came to Shanghai by choice, but she exaggerates their latitude of choice in staying there, especially those who came to Shanghai because of rebellions and natural disasters and who could not so easily and immediately return home whenever they felt like it (p. 120). Ye mentions the recurring question of whether Shanghai was a mire of iniquity or a model settlement, but does not take into consideration the meticulous analysis of the “colonial mind,” troubled and disturbed, shown in the historical studies of Cohen and Saari (which is played up in the accounts by Janku and Vittinghoff, to be discussed below). The evidence presented by Ye suggests that colonialism found little reflection on the pages of the Dianshizhai. If Dianshizhai huabao (a source of “valuable information about the daily life of the time”) “played a profound role in influencing popular tastes” (p. 1), how did it do so? What impact did the journal have on the ways in which the city’s reality was perceived, how were social types constructed, and how, in turn, did people bring forth these aspects in their behavior, movements, and narrations? The book presents the material that could address these questions, but it does not venture many answers. How could it have done so? In many cases, the book could have provided more context (sometimes it is hidden in the footnotes, e.g., p. 114, fn142) to show convincingly how and why the Dianshizhai embodied and reflected contemporary Shanghai as a locus of change. The enormous historical significance, for example, of the very early and rather liberal discussions of the “handshaking ritual” on the pages of the Dianshizhai (22) would have been more apparent if compared with the continued and much more conservative debates about handshaking and hygiene in the Republican period found in the news media as well as other prose writings. Similarly, it would have been useful to elaborate on the intriguing but not self-explanatory remark that the “increased use of the printed word in the modern press, journals, and on stationary challenged traditional reverence for lettered paper” (p. 1, 205, and 213ff). As Vittinghoff argues, both the Dianshizhai and the Shenbao were rearranged and collected as books, a practice apparently still motivated–Ye denies it–by the reverence for paper. In this regard, it is also important to note that Major’s earlier pictorial, the Huanying huabao , which had simply reprinted pictures from foreign pictorials, had not been a success. The Dianshizhai huabao, on the other hand, was designed precisely to fit into the traditional Chinese market in every formal way possible–in terms of the physical quality of paper, the printing and binding, the painting (and repainting of foreign models) and layout–while maintaining the thrill that what was published there was utterly modern and up-to-date. Here, too, we see the importance not just of change, but of continuity. While the main argument of Ye’s book may not always be convincingly presented (as it decidedly was in dissertation form), the book is still very useful and highly commendable. It can be of formidable use in locating primary sources on a myriad of subjects dealing with social life in late Qing Shanghai, and it offers many translations and summaries of Dianshizhai and Shenbao material that are very welcome for teaching, since the language of these texts is quite difficult for students. Indeed, most of the criticisms proffered here are slightly unfair: they are written at a point in time when the field, once pioneered admirably by Ye in her 1991 dissertation, has exploded and when many others who once took off from where Ye started, using her dissertation as a goldmine and guide for important materials, have published their interpretations on late Qing print culture and have thus added to the level of knowledge on these media and the sophistication with which to discuss them (see Goodman, Henningsmeier, Huntington, Janku, Kim, Mittler, Vittinghoff, Wagner, and Xiong). Ye is the giant on whose shoulders they all stand. Much important information has been uncovered by now, such as on the veracity of Shenbao’ s and Dianshizhai huabao’s alleged “un-Chinese viewpoint” (p. 6); on their journalists as “Confucian” moralists (p. 9) and on their confident self-image (in spite of their lack of success in the examinations and “common prejudice” against them, they formed a new self-made elite, [pp. 12-13]); on the important differences between attitudes in the Shenbao and the Dianshizhai huabao (which are conceived in Ye’s book as one and the same); on the importance of foreign pictorial material in the production of many of the Dianshizhai pictures (p. 25); and on the significance of stories of the strange in the context of the news media (did the writers really disbelieve these stories, as Ye would have it? [p. 26]) As the following discussion shows, such issues have been addressed in other recent publications. Ye cannot be blamed for failing to provide all these answers; to the contrary, she should be thanked for raising so many questions. Andrea Janku. Nur leere Reden. Politischer Diskurs und die Shanghaier Press im China des späten 19. Jahrhunderts (Wiesbaden: Harrassowitz, 2003). ISBN10: 3-447-04460-8; ISBN13: 978-3-447-04460-8. Andrea Janku’s study Nur leere Reden. Politischer Diskurs und die Shanghaier Presse im China des späten 19. Jahrhunderts (Just empty speeches: political discourse and the Shanghai news media in late nineteenth-century China) is an elaborate account of the early Chinese press and its position in late Qing political discourse. It takes Ernest Major’s Shenbao, one of the most influential and long-lived newspapers in late nineteenth century China, as the primary example while drawing also on the media around it, including missionary and official press. Janku aims at answering the questions, How did the new press become part of existing hierarchical structures of political communication? And how dangerous was it considered for the state to lose its monopoly and control over the so-called “road of speech” (yanlu)? The book gives convincing evidence for the prevalence of a discourse of political renewal in the much-maligned “commercial press,” long before the magic date of 1898, and long before Liang Qichao’s first press publications. In its seven subsections, the book first deals with Chinese wenren, or literati, as actors in the Chinese news world of the nineteenth century and traces in detail the stories behind Ernest Major’s and Huang Xiexun’s long-standing relationship as the owner and editor, respectively, of the early Shenbao (chapter 2). Janku’s study then discusses the genesis of the Chinese editorial (lunshuo), taking into account well-known Anglo-American models as well as the Chinese literary tradition of “statecraft writings” (jingshiwen) (chapter 3). In a chapter focused on the Sino -French war in the mid-1870s, Janku shows how the Shenbao put itself on the scene and was apparently also accepted as a new type of censorate, when it had become blatantly obvious that the old state censorate had become dysfunctional (chapter 4). In taking a later incident, the 1898 reform period, as a further example, Janku shows how this acceptance was achieved. Her analysis illustrates which rhetorical conventions the Shenbao would use to package reform ideas and make them acceptable subjects of discussion. Janku argues that by choosing a particular order of speech, editorials achieved a function similar to court memoranda (chapter 5). The next chapter (chapter 6) elaborates on alternative discourses of “saving the state”–that is, of “saving the system,” of “Western-style modernization” (yangwu) discourse, and of “thorough reform” (weixin) discourse, all of which found their reflection in official writings and, in almost identical fashion, on the pages of the Shenbao. This chapter illustrates the profound interconnections between presumably separate spheres of discourse. Next, Janku shows different press reactions to the suppression of the reform movement and to the court condemnation of Kang Youwei as a traitor. Both Shenbao’s demure and Xinwenbao’s provocative editorial discussions of the “Kang Youwei Case” show that Empress Dowager Cixi’s attempt to stop the involvement of the press in political affairs and officially close the “road of speech” that newspapers such as the Shenbao had used for many years had not been successful (chapter 7). When this crisis eventually culminated in the formulation of a press law in 1908, the state only seemingly gained back its right as “master of discourse,” since with a law in place, the press was now at the same time officially acknowledged and established as a self-confident new force in a non-state public sphere. According to Janku, the 1911 revolution and the attendant rise of a new generation of journals and journalists were due less to the state’s failure to control this new force. She shows that the early newspapers played the most important and intricate part in this story. Old-style journalists thought that to adhere to the style of the statecraft writings was orthodox, but the publicity surrounding them made their statements potentially subversive. Thus, by both adhering to conventions and subverting them at the same time, they successfully used the newspaper as a medium of public communication. But in so doing, they unknowingly undermined their position. They had in fact prepared the ground for those who, years later, would get rid of them ruthlessly and then write the story of new-style journalism (chapter 8). In tracing this road to self-destruction, Janku debunks the prevalent view of the early Shenbao seen from the perspective of the reformers, which has become part of the standard history of the newspaper. At the same time, she provides a small number of elaborate case studies, made statistically viable in Vittinghoff’s prosopographical survey of early Chinese journalists, to be discussed in the next part of this essay. With admirable care, Janku combines close readings of complete editorials, which she presents in the original and in translation, with extremely careful historical research. The book is to be commended for this detailed historical and philological approach. Janku comes up with a number of significant findings. She suggests that the press changed the institutional principles of communication that had dominated Chinese political discourse for many centuries. In tracing a significant spread of important political debates among the elite through newspapers, she is able to confirm that commercial newspapers such as the Shenbao were not simply commercialized news services (as Ge Gongzhen and his followers would have it) but rather political organs of a new style. Janku goes so far as to claim that people would come to Shanghai because they saw it, not the capital Beijing, as the center of political activity (see also Vittinghoff). The dimensions of debate on the pages of the Shenbao were such that even the government began to use the newspaper to voice its view, by passing on particular edicts to the press (p. 128). Moreover, Janku demonstrates the immense importance of commercial newspapers such as the Shenbao for increasing and redefining knowledge in the late Qing (e.g., Darwin and Spencer, p. 257). Janku narrates the emergence of new social forces and analyzes how they made themselves heard. She argues that the press did not have any inherent power; rather, the press was empowered by the belief of many players in the public sphere in its potential (pp. 143-144). The newspapers could express what officials were afraid, because of threat of imprisonment, to say; the court could close the “road of speech” and stop officials but not the newspapers in the foreign concessions. This argument to some extent contradicts Janku’s point, which is repeated often, namely that the actions of Shenbao writers were delimited by the fact that they had no official legitimation. On the other hand, Janku shows that the press was accepted almost as soon as it was established as a useful and therefore legitimate party to the discourse. In her meticulous study of text, rhetoric, and the use of classical quotations in the early Chinese-language news media Janku argues that the need for speedy text production led to resorting to established and conventional patterns of writing statecraft writing. An equally important observation is that both “conservatists” and “reformists” used the same rhetoric, the same genres of writing and forms of argumentation. Indeed, many of her readings confirm that the more radical the content, the more conservative the form and language in which it was presented (p. 303). This practice continues even beyond the May Fourth divide, a divide that Janku invokes with undue emphasis. Her discussion is limited to the late Qing. While she manages to show that most of the ideas that determined May Fourth discourse had existed much earlier, at least since the 1870s, Janku repeatedly invokes the new vehemence with which these ideas would be proffered later (e.g., p. 321). As her book ends with the Qing, she has no evidence for this change in tone. In fact, many of the quotations and issues discussed in her book lasted into as late as the 1920s. The question of minqi, the “citizen’s spirit,” to give just one example, is still a focus in the May Fourth era (cf. Mittler 388 f). With white terror and censorship waging high in the later years of the Republic, vertical communication was still problematic. Janku’s view that Chinese bureaucratic communication, through and by the newspapermen, actually changed from vertical to horizontal communication is perhaps a bit too optimistic: if that shift had been as successful as Janku perceives it from a late-Qing perspective, by the May Fourth period no one would have needed to talk about minqiany longer. The book is strongest in the chapters that talk about China before 1900 and the Shenbao. Chapter 8, which deals with the emergence of press laws around the turn of the century is a bit of an anticlimax. The interesting caricatures are not sufficiently integrated into the discussion, the arguments on language change proffered here are all made for newspapers other than the Shenbao, newspapers that Janku has studied only sporadically. Her remarks on short commentarial forms in the Shenbao after 1904 remain sketchy. These minor criticisms notwithstanding, this is a gripping and emphatic account of the final decades of the Qing that makes the period come to life. Through her full translations, Janku allows the reader to relive the day-by-day experience of reading Shanghai newspapers and feeling the country’s crisis grow. Natascha Vittinghoff’s Die Anfänge des Journalismus in China (1860-1911) (The beginnings of journalism in China, 1860-1911) sums up and synthesizes the scholarship on the early Chinese press and offers new insights not just from the newspaper text but from hitherto unused archival material. Her collossal book is the most comprehensive study of the early Chinese press published so far. She deals not with one newspaper, as do Janku and Ye, but rather with two principal newspapers and one short-lived daotai gazette (Shenbao, Xunhuan ribao, and Huibao, including its reincarnations). Vittinghoff’s writing is openly revisionist. Even more decisively than either Janku or Ye, she turns against the common assumptions that the journalism of nineteenth-century China was socially and politically irrelevant, contained only trivial and absurd stories, and was published merely out of commercial interest. This book makes it clear that although much ink has been spilled on the history of journalism, we have been unable to gain a lot of information about journalism itself from it. Accordingly, three of the nine chapters into which the book is divided deal directly with issues of historiography. First, the low position of the journalist in China postulated in standard writings on the press is discussed and uncovered as a global trope of mistrust (chapter1). Second, the categorization of newspapers into foreign and Chinese and thus patriotic or not, into conservative and progressive, and so on is seriously put to question (chapter 5). Third, the particular position of Liang Qichao and reform journalism is uncovered as nothing more than a self-fulfilling prophecy (chapter 9). The six chapters flanked within this historiographical frame provide the technical details that can be used to answer questions raised in the historiographical accounts. Chapters 2-4 deal with the journalistic field, the conditions and institutions in which journalists would be integrated, their education and family backgrounds, as well as their economic and working conditions. Chapters 6-8 deal with the particular texts produced by journalists, uncover journalistic self-definitions and the legal status of the early newspapers, and finally study the first stages of the professionalization of journalism in China around the turn of the century as well as its preceding movements. Vittinghoff understands the newspaper not so much as a “foreign medium” introduced to China, but more as a medium in which foreign and Chinese formed a hybrid characterized by constant exchange and change in which foreign and Chinese elements blur to such a degree that they become almost indistinguishable. Vittinghoff’s ingenious hermeneutic method is to draw on both external comparison and precise contemporary historical contextualization. This method ensures an understanding and evaluation of the polemical background of a particular argument, thus placing this argument within a new hermeneutic frame, which makes it appear much different from conventional post-facto understanding. Take, for example, the question of newspapers such as the Shenbao being “commercial undertakings”: Vittinghoff shows very clearly that the argument of “profitability” is mentioned so forcefully by Major only because he was in a particularly difficult situation at the time and needed to show that he was not trying to be political: he opted for commercialism instead. When in the last chapter, Vittinghoff discusses the development of the myth of “new journalism,” à la Liang Qichao, she does this, again, in the context of its gestation: she uncovers a contingent discussion, dependent on a particular polemical context that is neglected in historiographical descriptions, which simply take words that were part of a controversial and highly emotional discussion at face value. Vittinghoff thus shows very convincingly that it was less Liang’s superiority and more his precarious position as a newspaperman writing for China but living outside China that explains many of his deprecatory writings against his journalist peers within China. Yet these statements have been read as fact because of his later influence. Indeed, in his polemics as well as in the development of his particular “new style” prose (xin wenti) for which he became so famous, Liang Qichao could and would build on a long history of newspaper rhetoric of which he made use but did not acknowledge (421). Liang took up may conceptions from those “old new papers” and developed few new ones. Nevertheless, press historiography has perceived the ideas he propagated as incontrovertible Truth. Here and elsewhere throughout the book, Vittinghoff uncovers the importance of contingencies, so much so that her method may seriously call into question some of the findings in the larger-scale studies. Yet this strength may be considered a fault as well: from such microscopic findings, the book sometimes makes sweeping generalizations that should have been combined with a few more macroscopic analyses in order to hold more firmly..
Not unlike Janku, Vittinghoff provides a detailed description of the background for the developments of a new literati-culture in treaty-port cities such as Hong Kong and Shanghai. Both their books show the importance of the missionary press for the development of the Chinese press generally. Vittinghoff also provides a very careful comparative description of the newspaper world in Hong Kong and Shanghai, raising the reader’s awareness of many of the contradictions in the secondary literature we have perused so far. When considering the court gazette (jingbao) as part of the newspaper environment (pp. 56-61), she illustrates that receiving and exchanging official news was actually not as difficult as is often assumed (and as Janku, for example, would have it). Vittinghoff discusses the commercial availability of the jingbao and argues, citing official censorship reports, that indeed there was some kind of a newspaper public even before Western-style newspapers came to China. Vittinghoff even does the tedious job of comparing price information and comes to the conclusion that instant editions of the jingbao were much more costly than those of the new Western-style papers, the xinbao (pp. 58-59). In the end, this was one of the reasons the xinbao was successful in its inclusion of the court gazette. Vittinghoff points to some of the lacunae in newspaper scholarship: a history of these official papers (guanbao) as commercial undertakings remains to be written, especially concerning their fate after the new papers began to appear and reprinted them. One minor correction: Ocko has found a number of mentions of foreigners in the jingbao. The claim that the jingbao does not contain news about foreigners may be just as erroneous as claims concerning other newspaper types, which Vittinghoff forcefully and rightfully debunks. The attention to detail is the most important strength of this book. In order to get at these details, the author has engaged in time-consuming puzzle work–for example the elaborate character studies of early journalists, the study of the professionalization of journalism, and the treatment of the foreign actors in the newspaper scene. Many disagree with essentializing China, but constantly and lightheartedly essentialize “the West.” Vittinghoff does not. Whereas Janku illustrates that an elite public was involved in political discourse through newspapers such as the Shenbao, Vittinghoff goes even further. In her discussion of news, readers’ letters, and other sections of the paper, Vittinghoff shows that the readers of the Shenbao and other newspapers came from a broad social background, including merchants, actors, teachers, and politicians. The fact that the habitus of the newspaper writer and the professional journalist ranges between Bohème and Confucius supports Janku’s earlier implication that writers in these early newspapers were conscious political actors. They were addressing themselves not to an abstract audience but always to the court in Beijing (p. 118). They were confident journalists, not the riff-raff described in later histories. They were well-educated and even well-paid (one more puzzle that Vittinghoff solves). Another astonishing and important part is found in the discussion of how negative stereotyping of “early journalism” (that is, pre-Liang Qichao) entered Chinese historiography and has found its way even into seminal Western studies such as Nathan, MacKinnon, and Judge (pp. 33-34). The book does pioneering work in reading the daotai papers Huibao, Yibao, and Xinbao. Close reading illustrates that these papers were not conservative and xenophobic, as is often stated. Instead, they called for opening the road of speech, subscribed to the London Times, and worked together with local merchants. It is extremely difficult to get to the sources that Vittinghoff has uncovered. Once more, she illustrates the difficulty of categorizing newspapers and shows how intricately interrelated the newspaper world was, as official criticism of Shenbao in 1882 would stop the new daotai from continuing with the Xinbao, for example (p. 220). Vittinghoff analyzes mostly the 1870s, supplementing Janku’s information on the 1880s. It is important to see that already in the earliest period of Western-style newspapers in China, both the people and the state believed in the power of the press and that the state never faught against it but instead made use of it. In Vittinghoff’s brilliant discussion of the Yang Yuelou case, it becomes clear that press restrictions actually came more likely from the British than from the Chinese side. It was the British who did not want to allow too much freedom for these publications, fearing difficulties for themselves (370-372). The continued inactivity of the Chinese government in formulating a press law, it turns out, was not by chance but by deliberation (326). The chapters on texts (chapter 6) and negotiations (chapter 7) are not as well developed as the rest of the book. The analyses in chapter 6, for instance, are not based on primary sources, a practice that Vittinghoff criticizes in others. The argument proffered here could have engaged with the much more detailed treatment in Janku’s or even in my own work. The section on stories of the strange could have been strengthened if the question of fact and fiction had been addressed (as in Huntington and Mittler). Yet these are minor criticisms in view of the vast terrain the book covers and the myriad of different sources of which it makes use. What all of these books show is that the modern Chinese press, from the minute it began to rise in the mid-19th century, took on a central role in social, political and cultural communication in China. It opened new avenues of discourse, and strengthened and expanded old avenues of discourse; it incorporated many influential and important voices, personalities and institutions. The generally hybrid character of the newspaper allowed for showing a myriad of different viewpoints. Each of these books is a treasure mine for the amount of primary material it reprints or translates (with numerous illustrations from and translations of newspaper articles and archival documents cited at great length and with appendices containing useful statistical material and bibliographies counting dozens of pages). Each of these books gives, from its particular point of view, a comprehensive account of one particular vista into the press in late ninteenth century China. There are still many questions that remain unanswered, but each one of these books has shown how important and enriching it is, for the study of newspapers, to read closely the newspaper text and to contextualize this text within the sea of other texts that influenced it. As both Janku and Vittinghoff have recently moved to England (SOAS and Edinburgh, respectively), it is to be hoped, in view of the enormous importance of the findings collected in their books, to contextualize narratives such as Ye Xiaoqing’s, Christoper Reed’s, Joan Judge’s, and the many others who have been published recently, that these two important volumes will soon find their English translators, since only parts of these studies have been turned into English-language publications (Vittinghoff 2001, 2002, and 2004; Janku 2004). Chow, Kai-Wing. 2004. Publishing, Culture, and Power in Early Modern China. Stanford University Press: Stanford University Press. Cohen, Paul. 1987. Between Tradition and Modernity: Wang T’ao and Reform in Late Ch’ing China. Cambridge: Harvard University Press. Goodman, Bryna. 1995. Native Place, City and Nation: Regional Networks and Identities in Shanghai, 1853-1937. Berkeley: University of California Press. Henningsmeier, Julia. 1988. “The Foreign Sources of Dianshizhai huabao, a Nineteenth Century Shanghai Illustrated Magazine.” Ming Qing Yanjiu, 59-91. Huntington, Rana. 2003. “The Weird and the Novel: Zhiguai and late Qing Periodicals.” In Judith T. Zeitlin and Lydia H. Liu eds., Writing and Materiality in China. Cambridge: Harvard University Press, 341-96. Janku, Andrea. 2003. Nur leere Reden. Politischer Diskurs und die Shanghaier Press im China des späten 19. Jahrhunderts. Wiesbaden: Harrassowitz Verlag. —–. 2004. “Preparing the Ground for Revolutionary Discourse: From the Jingshiwen Compilations to Journalistic Writings in Nineteenth Century China,” T’oung Pao90, 1-3: 65-121. Judge, Joan. 1996. Print and Politics: “Shibao” and the Culture of Reform in Late Qing China. Palo Alto: Stanford University Press. MacKinnon, Stephen R. 1997. “Toward a History of the Chinese Press in the Republican Period.” Modern China 23, 1: 3-32. Mittler, Barbara. 2004. A Newspaper for China? Power, Identity and Change in Shanghai’s News Media, 1872-1912. Cambridge: Harvard University Press. Nathan, Andrew J. 1981. “The Late Ch’ing Press: Role, Audience and Impact.” In Zhongyang yanjiuyuan guoji Hanxue huiyi lunwenji, lishi kaogu zu (Papers from an international sinological symposium at the Academia Sinica, History and Archeology). Taipei, vol. 2: 1281-1308. Ocko, Jonathan. 1973. “The British Museum’s Peking Gazette.” Ch’ing-shi wen-t’i 2/9: 35-49. Reed, Christopher. 2004. Gutenberg in China: Chinese Print Capitalism, 1876-1937. Vancouver: University of British Columbia Press. Saari, Jon L. 1990. Legacies of Childhood. Growing up Chinese in a Time of Crisis, 1890-1920. Cambridge: Harvard University Press. Vittinghoff, Natascha. 2001. “Readers, Publishers and Officials in Contest for a Public Sphere and the Shanghai Newspaper Market in Late Qing.” T’oung PaoLXXXVII, 4-5: 393-455. ——. 2002a. “Unity vs. University: Liang Qichao and the Formation of a ‘New Journalism’ in China.” Late Imperial China 23, 1 : 97-143. ——. 2002b. 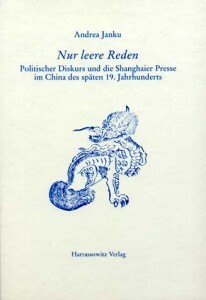 Die Anfänge des Journalismus in China (1860-1911). Wiesbaden: Harrassowitz Verlag. ——. 2004. “Social Actors in the Field of New Learning.” In Natascha Gentz-Vittinghoff and Michael Lackner eds., Translating Western Knowledge into Late Imperial China. Leiden: Brill. Wagner, Rudolf. 2001. “The Early Chinese Newspapers and the Chinese Public Sphere.” European Journal of East Asian Studies 1/1: 1-33. Xiong Yuezhi. 1995. Xixue dongjian yu wan Qing shehui (The dissemination of Western learning and late Qing society). Shanghai: Shanghai renmin. Ye, Xiaoqing. 2003. 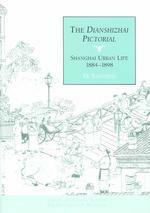 The Dianshizhai Pictorial: Shanghai Urban Life, 1884-1898. Ann Arbor: University of Michigan Press.